Escape-Central - Escape & Tribute CAMPING OUT How-To's !!! Escape-Central > ESCAPE TRIBUTE FORUMS > General Chat > Escape & Tribute CAMPING OUT How-To's !!! 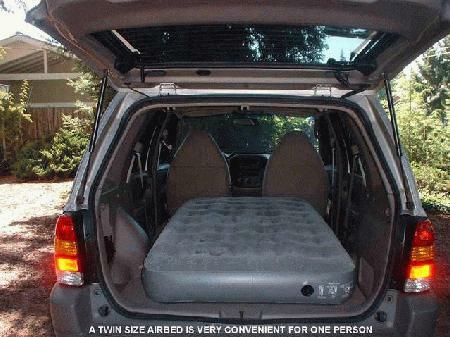 SUV CAMPING for two adults can be easy, comfortable, and very economical inside ANY stock Escape or Tribute. Two simple storage boxes you make are portable and drop in to make two beds 6ft-3in long. Air mattresses will fit also. This makes one of the best weekend vacations ever because your "No Boundaries" SUV can camp you overnight at where you really want to be, in most kinds of weather. What a View! You can be on pebbles at the fishing stream or on the sandy beach by your boat or up the mountain on a logging road! And everything locks up inside so you can hike. Click this link for complete details and Photos. These setups have been used since 2001! I revised the Camper Setup instructions to include the 2005 Escape/Tribute. The Console does not need to be removed from the truck to make the modification to fit in the airbed. 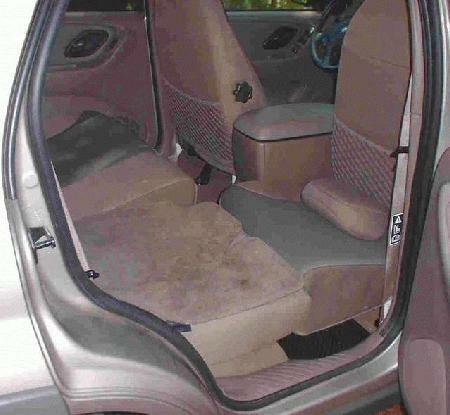 The front seats can be slid forward to provide an inside sleeping area 6'-3" long and 4'-6" wide at the shoulders. This is standard Double-Bed size, large enough to sleep two adults. But to make this into a bed you need to build a small, portable Luggage BOX for each sleeper. If you prefer to sleep on a considerably more comfortable home-style matress, install a standard Coleman Doublesize Airbed for two sleepers or a Twinsize Airbed for one and fill it firmly with an electric pump. To support an airbed you will need to use two Boxes and place a simple Bridge between them over the back part of the console. This is easy with the Low console but if you have the High console you will have to modify it very slightly to make enough floor length to install the airbed, but this modification won't change the stock look or feel of the console so no one will notice it. See instructions. Excellent information Jim, we will include your how-to's in our soon to be completed Escape-Central Projects area. Yeah I�m old, so type clearly, pull up your pants and get off my grass. Very nicely done. What would be the cost to put these things together? Do you have any estimates? Do you set a tent up to stow your gear? 1. Pack bug spray, marshmallows, chocolate and graham crackers into the Escape. 2. Drive to your destination, enjoying the lovely scenery from the safety of your Escape. 5. Meet others by the campfire with the S'more fixins, apply more bug spray. Now that's what I call roughing it. You may laugh, but that is exactly how I camp. I have some friends who usually go camping every June in Door County, WI. I am usually up there staying at a motel or a resort at the same time and I meet them for one night around the campfire eating S'mores, playing games and general goofing off. As ESCAPE-CENTRAL provides Information in their Projects Area, a lot of readers will be building the luggage boxes to create inside suv camper beds for themselves. There are a LOT of Escapes/Tributes out there and many more to come. Since the boxes aren�t expensive or difficult to make, some people will also make them for others and some will offer them on E-Bay. If you want to buy one now, pay someone with skills and equipment to make it for you. Consider a home craftsman or a professional cabinetmaker. Boxes are a cost-effective way to use the �No Boundaries� features of the suvs because you won�t have to buy any fancy, expensive backpacking stuff and haul it in on your own back and guard it. Everything you need locks up inside your SUV, all setup at the site for sleeping if you prefer. You can spend Your day and evening away from camp having fun the way you intended. If you travel to visit friends or relatives with limited space, they won�t have to find a bed for you. You won�t complicate their place. If you snore a bit, they�ll never know. The stock privacy glass gives good privacy so you won�t even be noticed sleeping comfortably in your SUV. As we have seen from other posts, some owners prefer the services of reservations and motels. That's great for them and I'm sure they've earned it! You can stop there too when you like. But when you�d like the extra adventure and economy of suv camping, it�s not very expensive to make a box or two and give it a try! The boxes are also useful to store loose items in the cargo area for a picnic or daytrip to the beach or ski slope or just shopping! Hey Jim, why don't you make some of these? What would be a price estimate of what something like this would cost? i agree! then i can paint them a kewl color kinda like luggage =) if i had split seats (i dont) i think they would be great for a road trip -just one with all the snacks in it for the rear passenger to get into and keep things organized . but id prob use it for camping too or the drive ins if they still have those around =0 but really how much would they cost to have done and shipped ? thanks for the creative info !